Many business and homes have a basement. Whether it’s finished or unfinished, it also requires cleaning on a routine basis to ensure it’s sanitary and germ-free for items stored in it and those who have to go into it. Even if your basement isn’t used, it should be cleaned on a routine basis. While the attic tends to get hot during summer months and cold during winter months, the basement is always damp for numerous reasons, no matter what season it is. A variety of cleaning products and equipment can be used to make the basement a healthy environment for individuals and items stored in the basement. Some geographic areas don’t use basements, for reasons such as seismic activity, the type of soil in the area and whether or not the area is prone to flooding. Although many insurance companies provide payment for damages to the home and basement, it can’t replace priceless items stored in a basement. There’s typically a limit to how much the insurance company can reimburse you, unless it’s a catastrophe and federal funding is made available to help home owners and businesses rebuild. All basements are generally colder because they don’t get as much sunlight compared to other areas of the facility. Above ground basements are partially under ground and partially above ground. While above ground basements get more fresh air and are only partially under ground, they’re often more humid and colder than other areas of the facility. Both above and below ground basements, especially if they’re unfinished, require routine cleaning. This includes basements that are not used or only have equipment, such as HVAC units or hot water heaters in them. That equipment often requires routine service and maintenance. Your basement should be well maintained, too. To make a healthy environment and to avoid potentially ruining items stored or used in the basement, humidity levels should be between 40% and 60%. Consider an energy-efficient dehumidifier to assist in keeping humidity levels at a safe level. Although dehumidifiers run on electricity, they generally don’t cause a large increase in your electric bill. Some dehumidifiers have settings to run in cycles or at certain times of the day or night. The harsh reality is that a humid basement can create mold. Allowing air to move through the basement helps it cut down on potential mold growth. The mold can be visible, but it also creeps into walls and the building’s foundation. 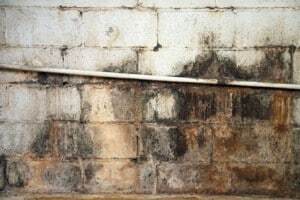 That mold can continue to move upwards to other areas of the home, deteriorate the structure and cause health problems. A dehumidifier can assist in keeping the basement at safe humidity levels, but visible mold should be killed using an aggressive disinfectant. The mold is typically visible on wall and in corners. Use products such as 80% Pure Pine or bleach that is EPA registered. Both products kill mold. Dilute the product as recommended by the manufacturer. Add the contents to a spray bottle. Move any items you don’t want ruined away from walls and moldy surfaces. Cover the floors with plastic if they’re not concrete or painted. If the basement walls are standard concrete or a painted surface, liberally spray the disinfectant above the mold and on the mold. Allow the disinfectant to sit on the mold for several minutes. If you’re looking to improve the appearance of the walls, use a deck brush to scrub the mold off the walls after the disinfectant sits on the areas. If the floors can tolerate water or if the basement has trenches or areas to collect water move it outside, you can use a hose to rinse the walls. If the basement doesn’t have any way to remove the water, use a lint-free rag and warm water to remove the disinfectant. Wear protective gear, such as a mask, gloves and shoes during the cleaning process. Dry the area with an industrial fan or a standard fan on the highest speed. If you use your basement as a storage area, use shelving units and sealable bins to store those items. Plastic shelving units or carts with wheels may make moving and cleaning areas behind the shelves easier. Sealable bins should be used for items such as fabrics, clothes, food (sealed), utensils, keep sakes such as Christmas decorations and other items that may not withstand the environment. Items, such as canned food that is completely sealed don’t require storage in a bin, but wipe down the outside of the canned items with disinfectant, then water before opening them for use. Keep items a few inches off the floor in case of potential hazards, such as flooding. Most people tend to seal off air vents and keep the basement cold and damp to save money on utility bills, especially when the basement isn’t being used frequently. Whether or not the basement is being used for storage or other uses, keep the air vents open to circulate air. On warm days with low humidity levels, open windows in the basement to circulate fresh air. A clean, dry basement can improve the environment of the entire facility. Worldwide Janitor has a variety of products that can assist in cleaning and disinfecting your basement. This entry was posted in Rust Treatment and tagged 80% Pure Pine, Luxor Shelf Black Cart, Pure Bright Bleach 10%. Bookmark the permalink.